If you missed Philip Townshend’s Sorry You Missed The Sixties exhibition earlier this year, there’s some good news. It’s returning to London, this time at ninetythree from December through to January. Sorry You Missed The Sixties is the decade as seen through the lens of Philip Townsend, featuring a host of icons and celebrities from "swinging London". Townsend spent most of the decade freelancing for the Daily Express, as well as featuring in the Tatler, Honey, Harpers Bazaar, Der Stern, Neue Revue, Tempo, Paris Match and New York Times. Included in the exhibition are Marlon Brando, Andrew Loog Oldham, Jimmy Page, Elizabeth Taylor, Aristotle Onassis, Marty Wilde, Dudley Moore, Richard Burton, Twiggy, Jacquelin Bisset, Charlotte Rampling and The Beatles – around 80 images from the photographer’s archive. There’s a private viewing on Thursday 7th December at the gallery, with the exhibition continuing until 14th January 2007 (but closed during Christmas week). If you’re on the look out for some bargain John Smedley tops, make sure you get down to London for the John Smedley Sample Sale on Wednesday 6th December. 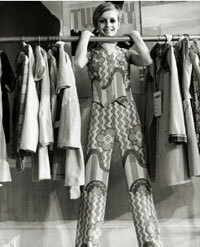 It’s being held at the London College of Fashion, John Princes Street (just off Oxford Circus), London. It starts at 10am and runs until 6pm. The stock will consist of slight seconds and design samples, with an average price of around £25. Coming soon – Captain Hammond! He doesn’t wear his underwear outside his trousers, he cannot climb walls or leap tall buildings in a single bound, he can however destroy all square music Super-Villains – enemies of the Hammond Groove! Captain Hammond is the brain child of Mother Earth’s Hammond hero Bryn Barklam who has joined forces with Greg Boraman and Pete Collison of Reverend Cleatus & The Soul Saviours. Greg has leapt from organ stool to drum kit and Pete has supercharged his guitar amplifier to complete this Hammond Organ Power trio. Mixing up Bryn’s soulful rock organ style with Pete’s heavy R&B guitar and Greg’s soul powered drumming, Captain Hammond mixes blues, rock and soulful Hammond screams – imagine The Small Faces jamming with The MGs – while Brian Auger pours the drinks! "Short documentary about the mod scene. Vespa scooters, 60s clothes, Parkas its all here. Director: Rob Poswall"